Teaching English abroad provides a viable, affordable and realistic way for almost any native or fluent English speaker to gain employment and enjoy the experience of living in a foreign country. At the same time, the endeavor of moving, living, working and traveling abroad requires research and planning, and matters like travel arrangements, visas, health concerns and safety. 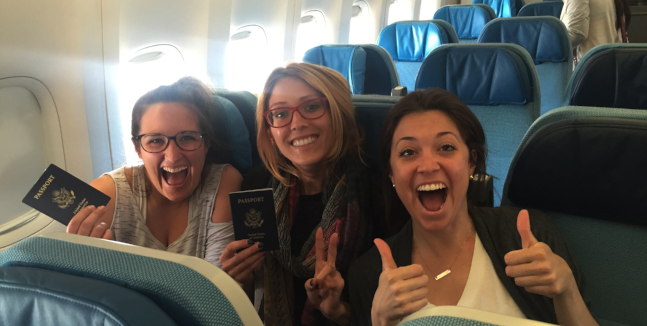 There are loads of great resources, to help you plan and prepare for your adventures abroad. Here are some of our top picks. Please note that some of the links below are affiliate links. We earn a commission for each purchase made but at no additional cost for you. If you have any questions about these companies, do not hesitate to contact us! STA Travel - Take advantage of STA Travel’s exclusive Airfare Deposit Program, "Book Now, Pay Later". It guarantees your airfare with a nonrefundable $300 deposit. Full payment is due seven days prior to departure and it's only valid on STA Travel exclusive airfare. StudentUniverse - StudentUniverse provides exclusive discounts, rewards, and experiences for students, faculty and youth (18-25). Please contact them directly for more details regarding eligibility and requirements for their travel deals. Kayak - A great flight search engine for fares leaving from the United States. This is an excellent starting point for searching for cheap airline tickets. Google Flight - Another great flight search engine that lets you enter your departure airport and see flights all over the world so you can choose the cheapest destination. Skyscanner - A global travel search site, Skyscanner helps you find cheap airline tickets so you can book your trip at the best price. The Flight Deal - The flight Deal helps you track discount airfare tickets by sharing flight deals regularly. Whether you're planning ahead or traveling spontaneously, you will find your fair amount of deals here. Secret Flying - Secret Flying is another great site to help you find cheap flight deals around the world. Typically, when you are teaching English abroad, you will live in a local apartment. In some cases, schools provide free housing to their teachers and in most cases you will find your own housing using various local resources, including your employer, coworkers, local publications, online resources and so forth. Here are some options that may prove to be especially useful if you need to line up temporary housing while you are settling in in your destination country, or if you are simply traveling. Travel guide websites such as the Lonely Planet and the Rough Guides are also very useful for finding accommodations abroad. Airbnb - A staff favorite! This site connects you with homeowners who rent out their homes, apartments or rooms to you. Homestay - Homestay allow guests to book a room in a local person’s home on a nightly, weekly or monthly basis for a fee. There is always a host present during the stay, enhancing the guest’s travel experience through their hospitality and local knowledge. Hostelworld - Hostelworld is a great site for searching and booking hostels around the world. Booking.com - A great resource for booking cheap hotels and other accommodation around the world. STA Travel - No matter where you are in the world, STA Travel can help you find the perfect place to lay your head. From a weekend getaway to a once in a lifetime adventure, STA Travel experts help you choose from a variety of accommodation options including hostels, hotels, and more. EasyRoommate - Find apartments and roommates worldwide. Agoda - Great resource for finding budget-friends hotels and resources. Couchsurfing - Matches member travelers with welcoming hosts in more than 100,000 cities and towns all over the world who open their doors and their couches/spare bedrooms. Accommodations are typically free and the terms of stays, including any financial arrangements to accommodate incurred expenses are usually worked out in advance. Roomi - Roomi is a shared housing platform making it safer and easier for ITA students to search for room rentals, sublets, and roommates. Use code “TEFL25” for $25 off your booking fee! Comforts of Home - Comforts of Home is Europe’s largest provider of accommodations for students studying and working abroad. Contact them and mention "TEFL" to receive €50 off any booking in the summer months (May-August) or a full semester booking. Housing Anywhere - Europe’s number one booking platform for international students going abroad, trusted by over 130 universities worldwide. HousingAnywhere helps their student to find quality accommodation near their university, hosted by trust landlords. wwwnc.cdc.gov/travel/ - The U.S. Government's Center for Disease Control and Prevention provides information and updates regarding health risks associated with international travel as well as recommendations for health precautions when traveling and suggestions when it comes to matters like vaccinations. www.who.int/ith/en/ - The World Health Organization also provides extensive information regarding international travel and health. www.state.gov/travel/ - The U.S. State Department website's travel section contains a wealth of health and safety tips relating to everything from specific country information relating to crime, terrorism warnings, emergency contact information for American citizens abroad, and tips for avoiding petty crime and scams. It also provides information for Americans who need to get a new passport, whether abroad or in the U.S.
For more on general health and safety, read 11 Basic Tips for Staying Safe While Teaching English Abroad. In some countries, it is typical for those teaching English abroad to receive health insurance through their employer and in some cases, it may be possible to purchase affordable health insurance locally. World Nomads - World Nomads insurance covers people from over 150 countries, with medical and evacuation cover, 24-hour emergency assistance and cover for a large range of adventure activities. STA Travel - STA offers trip, baggage, medical and accident protection as well as providing 24-hour worldwide emergency assistance. Allianz Global Assistance - Another popular travel insurance company, Allianz Global Assistance lets you choose from 3 insurance plans and provides a 24-hour assistance hotline as well. ISIC Card - The International Student Identity Card (ISIC) is the only internationally recognized student, teacher, youth ID card. With access to a global network of affordable and specialized student services, the ISIC card is your passport to more than 160,000 discounts and benefits in 133 countries worldwide. There are many providers and options, so it incumbent on you to research your options thoroughly. Visit their websites and research your options. You will typically be looking for long term insurance, 6 – 12 months. For more, read How Do I Get Health Insurance When I Teach English Abroad? Whether it's finding a low-cost hostel for a night's stay, figuring out how to buy tickets for a museum, or obtaining logistical information relating to visas, train tickets or renting bicycles, a good guidebook can be invaluable, especially when you first arrive in a new country. There are loads of options, but two options that International TEFL Academy highly recommends are Lonely Planet and the Rough Guides because they provide comprehensive practical information tailored for those traveling on a budget. Their websites are also excellent resources. You might also want to check out Triposo, a travel guide app that provides you with smart travel content across 50,000 destinations worldwide. Tips, maps, personalized suggestions... It's free and it works offline too. Eurail - One of the best ways to see Europe and on a budget is through train travel. Buy your Eurail pass here if you are going abroad to teach in Europe. Rome2Rio - Rome2rio helps you get from point A to point B the cheapest way possible and in over 158 countries! Flight, train, bus, ferry, driving... Enter your destination and it will display instantly your best options. Bla Bla Car - Not feeling like taking the train? Share a ride! A really affordable way to travel from one city to another, Bla Bla Car connects you to a driver with an empty seat and going the same way in 22 countries. Eurolines - Travel accross Europe on a bus! Eurolines is one of Europe's leading bus operator with a network of 600 destinations accross 36 European countries and Marocco. Gregory Lucyshyn - Our staff recommends expat accountant Gregory Lucyshyn, who has been preparing US tax returns for foreigners or citizens living abroad since 2005. E-File - For simpler tax returns, e-file offers a great affordable interface to e-file for Americans. The IRS website - If you are are not a U.S. citizen, you should consult the relevant government bodies for taxation and overseas citizens for your nation. For Americans, we recommend reviewing the IRS website for all up-to-date information. Typically you will need a passport to travel internationally and to teach English abroad. Here is basic information for how to obtain or renew your passport. U.S. citizens - You can apply by mail or in-person, typically at major U.S. Post Office locations (check www.usps.com for locations). If you are overseas, new passports can be obtained at the nearest U.S. Embassy or Consulate. Detailed information about applying for a U.S. passport can be found at the U.S. State Department's Passport web page. Canadians - Passport Canada Website provides step-by-step instructions for how to obtain a passport in their home country or abroad. Australians - Check out the Foreign Ministry's Passport Page. New Zealanders - Check out the Department of Internal Affairs Passport Website. U.K. Citizens - Visit the Home Office's Passport Identity and Passport Service Website to learn how to apply for a new passport. For more, read Do I Need a Passport to Teach English Abroad and How Can I Get One? 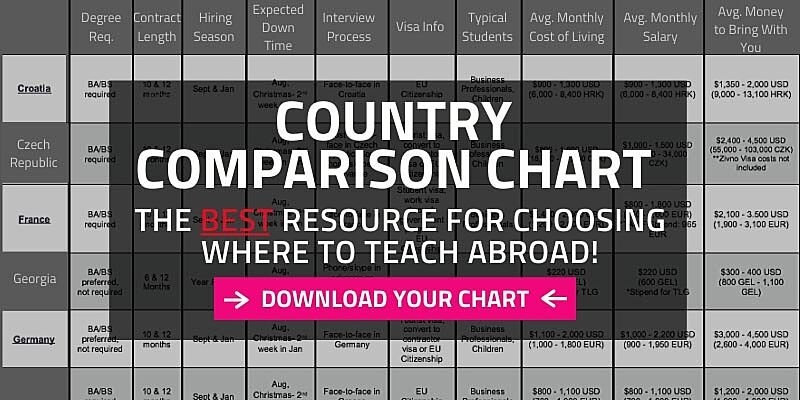 For a more comprehensive look at start-up costs for teaching English abroad, please review the International TEFL Academy Country Profiles and the Country Chart, which compares salaries for English teachers and living costs in more than 50 countries worldwide. www.xe.com - Handy website (and app for mobile devices) for converting currencies. www.oanda.com is also a good site for converting currencies. www.expatistan.com/cost-of-living/comparison - Compare cost of living in different countries around the world. www.numbeo.com/cost-of-living/calculator.jsp - Another useful tool for comparing living expenses in various cities and locations around the globe. Cell Phones - Typically you will need/want to get a local cell phone in the country where you teach English. It will be far cheaper and easier to stay in touch with local contacts (including prospective employers and private tutoring clients. Travel apps - Prepare your move abroad and get the latest phone apps for living and traveling overseas. Translation - Picking up a good phrasebook or even taking a language lesson prior to your departure for teaching English abroad is typically a great idea, and once you arrive, learning at least basic phrases for getting around is advised. You may also want to download apps for www.translate.google.com and/or www.vocre.com that enable translating on the go. Skype.com - Do we really need to introduce it? This world famous software application enables to you talk, video-shat and instant message with others around the world for free. It's great way, low-cost way to stay in touch with the folks back home and friends around the world. NOTE: In more than 90% of cases, you don't need to know the local language to get hired as an English teacher abroad! For more, read I Don’t Speak a Foreign Language – Can I Still Teach English Abroad? There are a variety of organizations and company that offer discount cards, or simply discounts to student and "youth" (typically 25 or 30 years of age and younger). Student cards and discount travel agencies typically offer discounted prices on everything from international airfare and travel insurance, to museum passes, train tickets and even travel equipment like backpacks. International Student Identity Card (ISIC) - The most well-known student identity card provides extensive discounts for travel services and marchandise. STA Travel - You can also obtain an ISIC card through STA Travel, which is an International TEFL Academy partner that offers many other discounted services and products, including travel insurance, airfare and more. StudentUniverse - Student Universe also provides extensive discounted travel services and products for college and university students. International TEFL Academy alumni and students should be aware that ITA enjoys a special partnership with Student Universe that enables International TEFL Academy students and alumni to take advantages of exclusive discounts on airfare and other travel services - please consult the Student Affairs Department for more information. The Points Guy - A miles & travel news site, the Points Guy gives you the opportunity to make the most of your frequent flyer miles and credit card points so you can travel even more. Definitely worth checking out. EdX - edX is the nonprofit online learning destination, founded by Harvard and MIT, that offers more than 900 high-quality courses from the world's best universities and institutions to learners everywhere. Book Depository - One of the world’s largest dedicated online booksellers, offering over nine million book titles, available for dispatch within 48 hours. Offers free delivery on every order, to over 100 countries. Now that you are prepared for travel, let's go have some fun by getting paid to live overseas & teach English abroad?